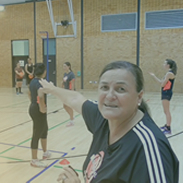 The netball wall drills are a great way of your player to practise their netball passing and receiving ball skills by themselves - helping to sharpen their skills and passing power. Using the wall drills and videos below your player will boost their chest, single hand flick, elevated jump and one handed passing and receiving skills. A key benefit of these wall drills are they also work your players foot movement, while improving their fitness and agility - perfect for any time in the season.